The Spiedie - a "Tasty Morsel"
The originator of the spiedie is most likely Augustine Iacovelli from Endicott, NY. Iacovelli immigrated to the Binghamton region from Civitella in Abruzzi, Italy in 1929. He first worked at Endicott-Johnson, a shoe manufacturer and the region's largest employer. In 1939 he opened a restaurant, Augies, on the north side of Endicott. The name comes from the Italian "spiedo," meaning "spit." (Moore 1991). The original sauce, which he called Zuzu, was wine vinegar, water, lemon juice, garlic and mint. The meat, originally only lamb, was cooked on wooden skewers (Boros 1984). A report from the local paper about the annual Speidie Fest in 1989 did not repeat the Iacovelli origin story but merely said it was "probably brought to the Triple Cities by Italian immigrants." Guido, Iacovelli's son, has stayed in the business and in the early 1990s ran a "mini-conglomerate of 26 restaurants from Rochester to King of Prussia, Pennsylvania" (Moore 1991). Guido said the original spiedies and those prepared now in Italy were not marinated; the sauce was sprayed on the meat before skewering and while cooking (Boros 1984; Moore 1991). Regarding the preparation, another local source stated that the Italian spiedie (presumably as prepared in Abruzzi) might have been a combination of food or unmarinated lamb on a skewer and that, instead of broiling over charcoal, the skewers could have been deep fried, broiled under a flame or fried in a half inch of butter. Depending on the ingredients, it might have been marinated or the skewer even dipped in batter (Anon 1974). Spiedie makers of today would likely not believe most of this information. Today, spiedies are always marinated in the sauce, sometimes for up to a week, but always for at least 24 hours. This long marination is useful for tenderizing the meat but, because of this chemical "cooking" it can be hard to tell when the meat is completely cooked on the grill. Many recipes warn about over-cooking and getting dry spiedies. Once cooked, the traditional means of serving is between sliced Italian bread, possibly French bread with extra sauce poured on. Commercial spiedies come in small buns. One of the interesting features of spiedies is that there is tremendous variety in the marinades and the meats used in the sandwich. The sauces almost always include oil (usually olive oil is specified), vinegar (various types) and garlic. After that, personal preferences seem to rule but most of the herbs are traditional Italian-american herbs - bay leaves, oregano, rosemary, basil, sage and parsley. Iacovelli's original sauce included mint and almost all the recipes using lamb still require mint but some recipes for other meats leave it out. Most of the commercially bottled sauces include mint. The mint is not there in small amounts just for a little bit of flavor; recipes call for 6-8 sprigs or 3-4 tablespoons of mint. While the first meat used was lamb, spiedies are now made with virtually any meat, including game such as venison and moose. A category for chicken spiedies first appeared in the Spiedie Fest cooking contest in 1987 and have become the most popular commercial version of the sandwich. The spiedie is the only sandwich I know of in the region that has a festival built around it. Modelled after the Chicago ribs festival, it was first held in 1983 and in early August every year since then. While attendance has grown and a large balloon event is built into the festival, it is still mostly a regional attraction. Regarding the diffusion of the spiedie, the real mystery is why is has not spread further. The sandwich is so tasty and the outlets sufficiently profitable that I am really confused about the lack of spread. But what has clearly happened is introduction on the personal level by Southern Tier residents who leave the region and feel the need for spiedies. The key element to making a spiedie is the marinade and the essential ingredients are widely available. When I was in Binghamton looking into the spiedie in the summer of 1997, I visited a large supermarket expecting to find a few bottles of spiedie sauce from one or two producers and was surprised to see an entire section about four feet long of many different types and manufacturers of spiedie sauce. This sandwich is completely integrated into the food culture of the region and people are taking it with them. "Being an ex IBMer my family loves Lupo's Spiedies. After finding your site, my son Chris ordered 20 lbs. and cooked them Saturday and Sunday in the parking lot at the NASCAR races this past weekend at Texas Motor Speedway. Chris introduced them to some friends from Kansas City and my other son Phil introduced them to friends visiting him from Tulsa, OK for the races. After driving his parking lot neighbors crazy while cooking them, they shared some with other NASCAR fans. Lupo's Spiedie fans can sure multiply in a hurry. Cheers." (Lupo Family 1999). A Rochester expatriate who moved to Minnesota proudly sponsored a spiedie fest there, bringing in someone from Endicott to cook the spiedies in the "heretofore benighted Minnesota (Dukro 1997). This very personal diffusion of the sandwich is due in part to the regular reassignment of IBM personnel to and from their large facilty in Endicott, NY - one of the Tri-Cities of Endicott, Johnson City and Binghamton, the core of the spiedie region. There was a claim that the sandwich spread to restaurants on the West Coast but I have not been able to document this (Boros 1984). Entrepeneurs do not appear to be spreading the spiedie outside its home region. There is a claim that they are available in "contiguous portions of neighboring states, including northern Pennsylvania." (Havemann 1993). There is also a cafe in Chicago with a chicken spiedie on their internet menu (Anon. 1999). There are occasional references to spiedie sauce being available in scattered locations in the south. A company in Memphis, TN, markets an Italian marinade that is a spiedi sauce. In 1986 Tom Caber, a Johnson City out-migrant, and an associate introduced the spiedie to the south at the Mid-South Fair in Memphis in 1986. They now bottle and sell the marinade but not with the name spiedie. Having claimed strength in the Memphis region, the firm itself is right in the center of the original territory, Vestal, NY (Caber Bros. 1999). There is no strong evidence of much commercial diffusion outside the home region (see Figure 2). 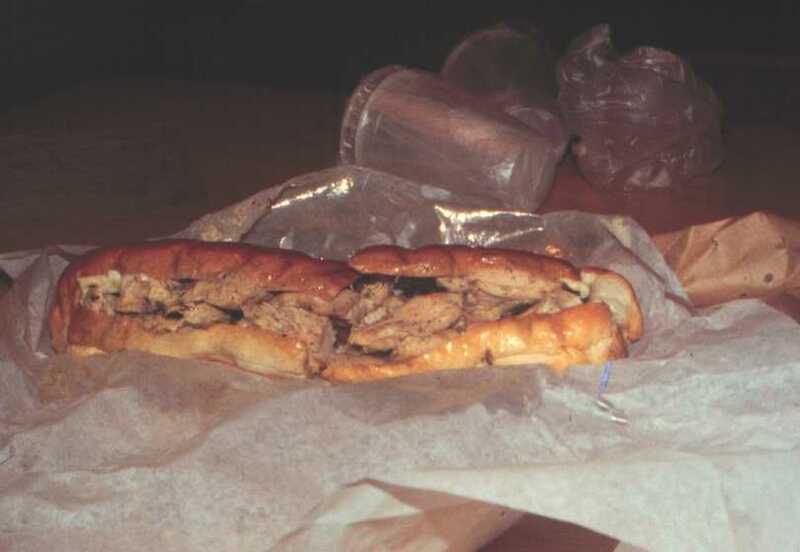 One entrepeneuer, Rob Salamida, did try to spread the sandwich in the early 1970s, but after a near disaster with a storm at his speidie stand at the New York State Fair in Syracuse in 1975, he decided to return to Binghamton and market the bottled sauce rather than the cooked meat or sandwich (Moore 1991). No references could be found to Salamida's sauce on the internet in July of 1999. However, in 2005 he informed me that they do indeed have a web site (Salmida 2005). So at least two vendors market on the Internet and by mail selling both sauces and marinated meats (Lupo Family 1999). It seems that the most successful form of diffusion has been the marketing of prepared spiedie sauce, mostly to migrants from the original source area. Gonzalez (1987) - Towns with spiedie restaurants nominated in a "Best Spiedie" contest run by a local newspaper. Havemann (1999). Personal e-mail communication. Moore (1991) - a New York Times (regional edition) article about the spiedie. Reference to 26 restaurants owned by the son of the original innovator. Only Rochester, NY, and King of Prussia, PA were directly mentioned. Pro-CD Phonebook (1997) - search on "spiedie" in CD telephone book. Plattsburgh and Fayetteville were the only places outside of Binghamton with "spiedie" in the restaurant name; there are probably other places where it can be obtained. Infoseek Search (July 22, 1999) - Reference to Chicago cafe offering a chicken spiedie. As I stated earlier, the spiedie has not moved far from its region in any formal or commercial sense. Many hundreds of residents of the core region have relocated, acquired the sauce and aquainted their new friends and relatives with the spiedie, particularly through the IBM connection, but there are few places where some commercial evidence exists of the spiedi outside the core region of the Southern Tier of New York state (and not even the entire Southern Tier, principally the Tri-City area of Endicott, Johnson City and Binghamton). Figure 2 shows the "Spiedie Region." Anon. 1974. Spiedies - an easy, tasty, gourmet treat. The Sunday Press. Binghamton, NY: Sept. 25, 1974, p. 11E. Anon. (July 22, 1999). The menu - Jillian's coffee house and bistro 674 W. Diversey Parkway, Chicago, IL USA. <http://www.tcfb.com/jillians/menuframe.html.>. Boros, J. 1984. Spiedie fest Sunday caps a tradition. Binghamton Evening Press. Aug. 3, 1984, p. 9A. Caber Bros. Jan. 12, 1997. (July 27, 1999). About our company - what's a spiedi? <http://www.bridgeware-systems.com/caber/about.htm>. Crabb, J. Quoted in Moore, M. 1991. "Don't Call it Shish Kebab - in Binghamton, it's Heaven." New York Times. Section C-3. 1.16.91. ____________. July 26, 1999. Re: Spieidies. Personal e-mail communication. Lupo Family. (July 22, 1999). Homepage. < http://www.spiedies.com/homepage.htm>. Salmida, Rob. (September 26, 2005). Homepage < www.spiedie.com.>. Williams, M. Dec. 29, 1998. E-mail message to Lupo Family (1999). <http://www.spiedies.com/guestbook/index.asp> (July 22, 1999).